"I don't mean "white" like Caucasian. I mean a white man like our friend Cusamano. Now he's Italian, but he's 'Merigan. It's what my old man would have called a Wonder Bread wop. He eats his Sunday gravy out of a jar." Hungering for America: Italian, Irish, and Jewish Foodways in the Age of Migration by Hasia R. Diner; Harvard University Press, 2003. "Italian-Americans; most specifically those in the greater Chicago, Boston, Providence, and New York areas favored the term gravy (rather than sauce) for their tomato based meat sauces." Yes, indeed, (if you're a 'Sopranos' fan, you'd know this) the Italian meat-and-tomato pasta covering we usually know as "sauce" is better known to many as "gravy" or "Sunday gravy". While marinara sauce was usually a fresh-tasting blend of tomatoes, tomato paste, garlic, basil and herbs, and ragu was bits of meats (and ground meat) cooked in a tomato-based sauce, "Sunday gravy" is more of a slow-cooked "peasant food" meal-in-one made with whatever was left at the end of the week; less herbs and seasonings, but flavors developed by simmering several cuts and types of meats and bones (basically whatever was available) with tomatoes and vegetables over a low heat for hours (or all day Sunday while the family went to church and so forth) until the meat infuses the sauce with lots of flavor and it thickens. It's almost a cross between typical brown gravy and tomato sauce. 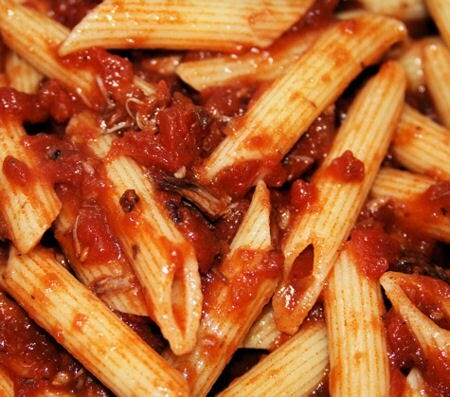 At dinner-time, the meat is then removed and served with the sauce and pasta, or saved for another day's meal. I've taken the actual recipe from my "Soprano's Family Cookbook" and modified it LIKE CRAZY (obviously) to make a "Sunday Gravy" that is of course vegan but still stays faithful to the heritage and idea behind the recipe, with a slow-cooked 'meaty' and gravy-like tomato sauce. This recipe is VERY hearty, definitely enough protein for several meals. I've found I only use a little bit of the sauce and end up freezing the rest or storing in the fridge for another day. REALLY good stuff though, and well worth the effort!! Italian 'Sunday Gravy' ala "The Sopranos"
The original recipe also has 2 lbs. of meatballs simmered in the sauce. You can use a package of 'Nate's' or your own recipe, but I find that to be major overload. Depends on how much "meat" you want. Heat the oil in a large heavy pot over medium heat. Put fennel seeds, portabello chunks, "sausage" and "beef tips" or whatever seitan product you're using, onion and celery, in oil and turn occasionally until "meats" are nicely browned on all sides. Add the garlic and cook for about two minutes or until golden. Add tomato paste and mix into "meats" and garlic, scraping any browned bits off the bottom of the pan. Take off heat. With a food mill, puree the tomatoes, with their juice, and add into the pot. Or, for a chunkier sauce, just chop up the tomatoes and add them. Add broth and water. Add salt and pepper to taste. Add cloves and bay leaf tied in a cheesecloth square. Bring the sauce to a simmer. Cover the pot and cook over low heat, stirring occasionally, for 2 hours (or in a crock pot 4 hours-to-all-day, on very low). If the sauce becomes too thick, add a little more water. If you want to use meatballs too, add them 1/2 hour before end of cook time. The original recipe has you remove the meat and serve it as the next course. That doesn't work so well with mushroom and seitan chunks so I leave it in the sauce. Toss the cooked pasta with the sauce. Sprinkle with nutritional yeast or whatever 'cheese' works for you. Enjoy with pasta while watching your favorite episode of "The Sopranos"
This looks bold, comforting, a delicious. Good job! I wanted to stop by and say hi to a fellow MoFo'er. I'm going to be sad to se the month come to an end. I'm so glad I discovered you. I love a good tomato sauce recipe! I have some Italian American friends that refer to it as gravy too. 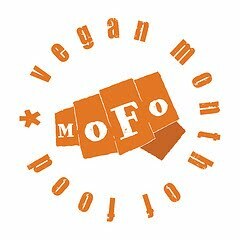 Happy almost-end of MoFo! Brilliant idea! Now can you tell us how to make braciole vegan?! Susan, I haven't made it myself, but can vouch for this recipe, 'cause the fine Soundly Vegan gals made it for me not long ago. and it was DEEEEEEE-LISH! !